Since the first edition of this book was written in 1977, there has been a tremendous increase in the use of Pascal. This increased use has had two significant effects. (1) It has produced a bett er understanding of the facilities of Pascal and their use. (2) It has fostered the production of the ISO standard for Pascal. 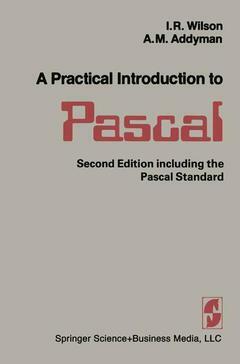 This second edition reflects both this better understanding and the clarifications and changes to Pascal which have resulted from the production of the BSljlSO Pascal standard. The standard (BS 6192, which supplies the technical content for ISO 7185) is the definitive document on Pascal. My work on the Pascal standard has convinced me that the description of a programming language may be tutorial, or it may be definitive, or it may be neither! The chapters of this book do not constitute a definitive description of Pascal. They are essentially tutorial. The book is based on an introductory lecture course given at Manchester. In addition to lectures, the course consists of two kinds of practical work. The first is based on the solution of short pencil-and-paper exercises. The second requires the student to write complete programs and run them using interactive computer terminals. Each chapter of the book concludes with exercises and problems suitable forthese purposes. Although solutions to all of these are not presented in the book, teaching staff may obtain them by application to the authors. 1 Introduction.- 2 The Form of a Program and Basic Calculations.- 3 Basic Control Constructs.- 4 Variables, Constants and Expressions.- 5 An Introduction to Input and Output.- 6 An Introduction to Procedures and Functions.- 7 Data Types.- 8 Structuring Methods 1 — The Sequential File.- 9 Structuring Methods 2 — The Set.- 10 Structuring Methods 3 — The Array.- 11 Structuring Methods 4 — The Record.- 12 Structuring Methods 5 — The Variant.- 13 Advanced Uses of Procedures and Functions.- 14 Dynamic Data Structures.- Appendix I Pascal Syntax Diagrams.- Appendix II List of Pascal Reserved Words.- Appendix III Answers to Exercises and Schema for Selected Problems.- The Pascal Standard.